Also known as a smokeless grill, Asian BBQ pan, Tabletop grill pan, and can used on a variety of stoves and fuel sources (Wood fired stoves, LPG stoves, Charcoal stoves, Butane stoves, and conventional gas or electric stovetops ). The perfect pan for grilling and searing your way to healthier eating! Great for grilling thinly sliced flavorful meats, fruits, vegetables, poultry, and fish. The stainless steel grill plate is tough and long lasting. 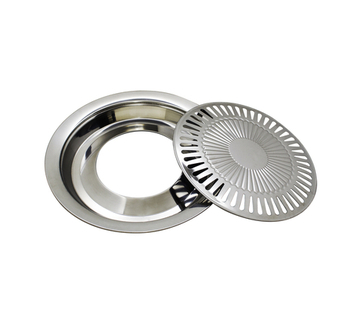 The convex grill shape allows for low-fat or no-fat cooking. 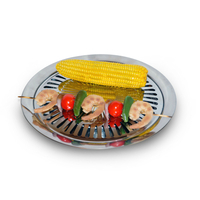 The elevated grilled food allows fats to drain by gravity through the grill plate into the bottom reservoir pan. Add a little water in the trough for easy cleaning and healthier cooking. This grill fits all SilverFire stove products, except our SilverFire Scout compact backpack / bug out bag stove. The grill plate bottom pan has a flat bottom that curves upwards to form a trough, where you add a little water while cooking. It does fit our Survivor, Hunter, Super Dragon, and larger fixed chimney stoves. Keep in mind the ventilated top will not seal out emissions when using the Hunter chimney stove indoors. Rounded trough to catch basting sauces below grill surface. Will work on any cooking surface. Flat base support: 9' diameter OD. $36.95 with shipping added at checkout for the Continental United States. Please call for shipping quote to Alaska, Hawaii, & Puerto Rico for additional USPS shipping fee total. Please call or write for all International shipping quotes. Returned SilverFire products subject to 25% product restocking fee and all shipping costs are non-refundable.